London, 2nd July 2018 – Whether it’s going on a car journey, walking around a busy city or even getting through a narrow doorway, travelling with two children has never been simpler thanks to Britax Römer’s new BRITAX HOLIDAY DOUBLE. 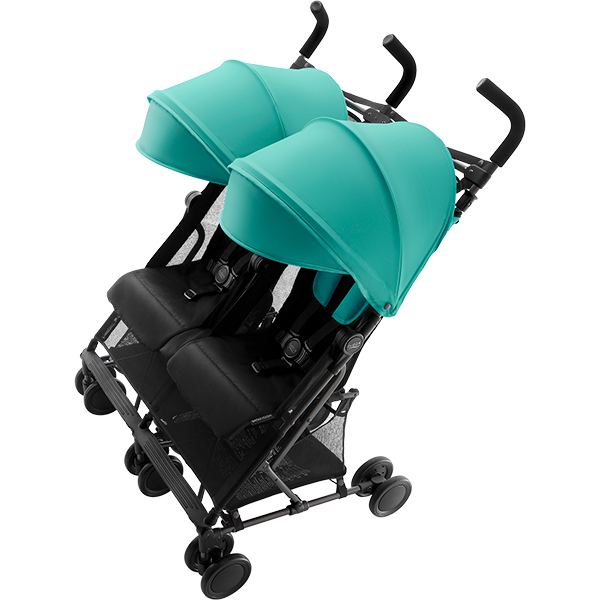 The lightest and most compact double buggy in Britax Römer’s growing pushchair range, the BRITAX HOLIDAY DOUBLE is only 76cm wide and suitable for children from six months – three years of age (15kg). Based on Britax Römer’s popular 2017 single stroller, the BRITAX HOLIDAY, the BRITAX HOLIDAY DOUBLE is the perfect solution for travelling with two young children. Weighing just nine kilograms, it offers complete freedom thanks to the comfortable and convenient carry straps that can go over the shoulder or be worn similar to a backpack, allowing for mum and dad to chase after their youngsters with ease. Wherever your journey takes you, the BRITAX HOLIDAY DOUBLE offers easy and quick folding features with an automatic fold lock, ensuring that it stays in a neat and compact position until it’s ready for its next outing. The buggy stands conveniently on its wheels when folded; keeping fabrics off the ground meaning they stay clean for longer. The BRITAX HOLIDAY DOUBLE comes with a five-point safety harness which can easily be adjusted to the height of a growing child, ensuring children are travelling in both safety and comfort. Ventilation mesh surrounds both sides of the seats and above the head, plus a canopy with a UPF of 50+ keeps children protected from the elements. 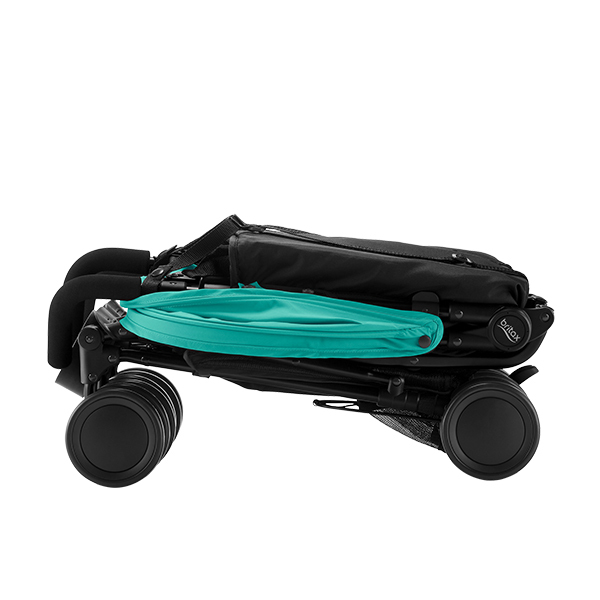 For additional comfort the pushchair comes with a foot support for young travellers and swivel front wheels, making the BRITAX HOLIDAY DOUBLE a delight to push. It also features puncture-free tyres, meaning parents can have peace of mind that no fun adventure will ever be unnecessarily cut short. The reclining backrest ensures a relaxed sleeping position for children and large baskets underneath both seats with a total weight capacity of eight kilograms allows for plenty of space for those travel essentials. “Made with Care” is Britax Römer’s philosophy to provide the highest quality of products to our customers. Britax Römer has strong internal standards for chemical and mechanical testing for fabrics and other components. These include regulatory guidelines such as REACH (a regulation of the European Union, adopted to improve the protection of human health and the environment from the risks that can be posed by chemicals) and Britax Römer’s own internal, often stricter standards, to which the quality of all products must adhere. Britax Römer’s efforts have been recognised in this area with consistent, excellent scores from leading consumer organisations such as Germany’s Stiftung Warentest. 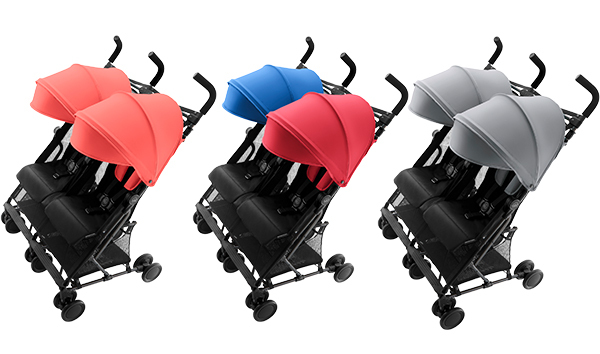 The BRITAX HOLIDAY DOUBLE is available in four colour options: Aqua Green, Coral Peach, Steel Grey and a unique two colour combination of Ocean Blue and Flame Red. It will be available from July 2018 with an RRP of £200.